Diarrhea is characterized by frequent liquid bowel movements accompanied by cramps, nausea, and vomiting. It can last anywhere from two days to more than a week depending on severity. Normally, the colon absorbs liquid from the food we eat, leaving stools more solid. Diarrhea occurs when the colon isn’t performing this function properly. Poor colon function has many causes, including food poisoning, poor diet, stress, medications, excessive consumption of fructose, and an array of digestive disorders. There are plenty of commercial remedies for diarrhea, but they can be expensive and they come with unwanted side effects. Luckily, you’re about to learn how to treat diarrhea safely and effectively, using simple ingredients you probably already have at home. Let’s get started! 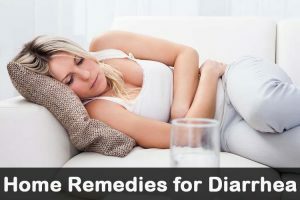 Follow these natural homemade remedies to treat diarrhea and its symptoms. Chamomile tea reduces intestinal inflammation and relieves abdominal cramps. Use a store-bought tea bag or make your own using the recipe below. Boil water and stir in 1 teaspoon each of chamomile powder and peppermint leaves. Repeat 3 times a day to get instant relief. Oranges promote proper digestion. Drink fresh-squeezed orange juice or make orange peel tea using the recipe below. Chop up the peel from 1 orange. Put it in a pot with 1 pint water. Bring to a boil, then reduce heat and simmer 5 minutes. Add sugar or honey to taste and drink. Repeat once daily to get rid of diarrhea. Blend 3 oranges and add 1 tablespoon sugar and 1/6 teaspoon salt. Add 1 ½ cup of water and drink 3 times in a day. Ginger promotes proper digestion and relieves abdominal cramps. Boil 1 cup of water and stir in 1 teaspoon minced ginger. Reduce heat and let simmer 5 minutes. Add honey to taste and drink. Grate small piece of ginger and add 1 teaspoon of honey. Eat this to get relief. Don’t drink water immediately after eating this. Stir 1 teaspoon powdered ginger and a pinch of sea salt into a glass of water. Carrots help replenish the vitamins and minerals your body loses because of diarrhea. Make 1 glass of juice from fresh carrots. Stir in few drops of lemon juice and honey as per taste. Drink this regularly to prevent diarrhea. Note: You can eat fresh-made pureed carrots. Fenugreek Seeds are one of the best remedies for diarrhea. Mix ½ teaspoon of fenugreek seeds into a glass of water or a cup of yogurt. Drink this to fend off diarrhea. OR Mix 1 I teaspoon of seeds with 1 tablespoonof yogurt. Eat this once in a day. Roast ½ teaspoon Fenugreek seeds and ½ teaspoon cumin seeds. Grind them to make a powder. Mix into 2 tablespoons of yogurt and eat 3 times daily for quick results. Lemon juice kills the bacteria that cause diarrhea, and ginger promotes proper digestion. Mix fresh-squeezed lemon juice into water and drink it, and try the lemon ginger tea recipe below. Squeeze juice from 1 fresh lemon. Add ½ cup of warm water to it. Sip this to treat the problem. Mix 2 teaspoons of lemon juice with ½ teaspoon of ginger paste and a pinch of black pepper. Consume this paste twice a day. Apple cider vinegar is a natural antibiotic. It kills the germs that cause diarrhea and relieves intestinal cramps. Drink it 3 times a day. Blueberries have anti-oxidant and antibacterial properties that support the digestive system and kill germs that cause diarrhea. Blackberries are good source of tannins, which relieve many diarrhea symptoms. In a soup pot, heat all ingredients until boiling. Reduce heat and let simmer 15 minutes or until berries are tender. Pour mixture into blender and puree. Store in refrigerator and consume 2 times daily. Boil 2 cups of water and stir in ½ teaspoon of dried blackberry leaves. Black cumin seeds have anti-oxidants, vitamins, and minerals that support the immune system and help cure diarrhea. Mix 1 teaspoon of black cumin seed oil into a cup of yogurt. Eat it 2 times a day to get relief from diarrhea. Salt and sugar help prevent dehydration. Mix 1 teaspoon of each into a glass of water. It will give glucose and electro-hydrates to body. Brown rice contains B vitamins your body needs to fight off diarrhea, and Bananas have pectin, which helps soak up excess water. Mix mashed banana into brown rice. Eat once a day to remove the toxins from body and thereby diarrhea. Honey soothes the digestive tract while ginger relieves gas. Mix 1 teaspoon each of powdered ginger, cinnamon, cumin, and honey. Consume the resulting paste 3 times a day to cure diarrhea. Cinnamon and cayenne pepper both support a healthy digestive system. Stir in ¼ teaspoon of cinnamon and 1/8 teaspoon of cayenne pepper. Drink ¼ cup every half hour to get instant relief. Nutmeg contains starches, potassium, proteins, calcium, safrole, and camphene, all of which relieve the symptoms of diarrhea. Mix 1 teaspoon each of nutmeg, flour, and white sugar. Stir the mixture into a glass of water until all ingredients dissolve. Slippery elm bark contains fiber that helps thicken stools and relieve cramps. Boil 1 cup of water and stir in 1 teaspoon of slippery elm bark. Yogurt contains probiotics—good bacteria that line your intestines to protect them from germs that cause diarrhea. The lactic acid in yogurt also kills bacteria. The live cultures in yogurt replenish good bacteria that may be killed by commercial antibiotics. Eat yogurt 3 times a day to relieve the symptoms of diarrhea. Garlic soothes and cleanses the digestive tract while reducing inflammation, and it is rich in potassium, which relieves abdominal cramps. Eat garlic raw and use it to season your food. Be sure to eat it 3-5 times a day depending on the severity of your symptoms. Avoid dairy products except yogurt and buttermilk. Avoid spicy, salty, and sugary foods. Eat simple foods that are easy to digest. Eat starches to soak up excess fluids in the digestive system. Include soups, rice, noodles, bananas, soda crackers, cooked carrots, potatoes, toast, skinless white meat chicken and cookies in your diet. Drink water, broths, organic fruit and vegetable juices, and sports drinks. You can also try using baking soda. Use a heating pad on belly to relieve cramps. Drink teas and eat plain foods. Drink only liquids for first 12 hours .After 23 hours follow BRAT diet (banana, rice, applesauce and toast) to get relief from the diarrhea. To transition back to normal diet, eat bananas, rice, and toast after symptoms subside. Wash hands frequently, especially after using the bathroom and before cooking or eating. Eat fresh foods instead of frozen, packaged, or highly processed ones. Drink fresh fruit juices specially pomegranate juice, mango, guava and avoid fruits which causes diarrhea like apple, prunes etc. Keep cooking areas clean and sanitized. Avoid stress by doing yoga, meditations and other activities. If your symptoms do not subside within a week, consult a doctor. Have you tried any of these home remedies for diarrhea? Which ones worked best for you? Share your experience with us! i didnt have any ingredients except baking soda and banana i mixed 1/2 tsp baking soda in 1/2 glass warm water drink this for upset stomach and cramps associated with diarrhea eat i ripe banana twice in oen day baking soda and water twice in one day,viola! diarrhea cramps upset stomach disappeared! depending on the severity of your problem this may take two or three times a day for two or three days only took me one! if this doesnt help see a doctor! Rice water is also very good for diarrhea. boil 1 cup of high quality rice (I use brown rice) in 4 cups of filtered water for 20 to 30 minutes. Filter to remove rice and let cool the liquid. Drink 1/4 to 1/2 cup after every bowel movement until stools start to solidify.